Whether winter be mild or harsh, short days and cold temperatures leave many aching for spring and warmer days. A new gardening season often gives cause for gardeners to try new plants. Catalogs entice their audience to loosen their purse strings with a bevy of new varieties and cultivars. I am not immune and have already placed several orders for new plants to grow at the Arboretum. If you have not grown them, or have only lightly dipped your foot in, consider adding bananas to your list of plants to grow this year. Musa, regarded as true bananas, comprise a genus of roughly 40 species indigenous to tropical Africa, India, Southeast Asia, and Northern Australia. To say the plant is fast-growing is an understatement. Thick suckering stems called pseudostems shoot upwards to heights of 15-20’. The term pseudostem is given as the plant does not produce a true stem but rather a collection of old leaf bases. Individual pseudostems flower once. Death occurs shortly after fruiting; however, the plant remains as other suckering pseudostems continue to grow from the original root mass. Flowers occur on large, pendulous or erect inflorescence. Female flowers bear fruit. Native to Sichuan, China, Musa basjoo is a reliably hardy banana. 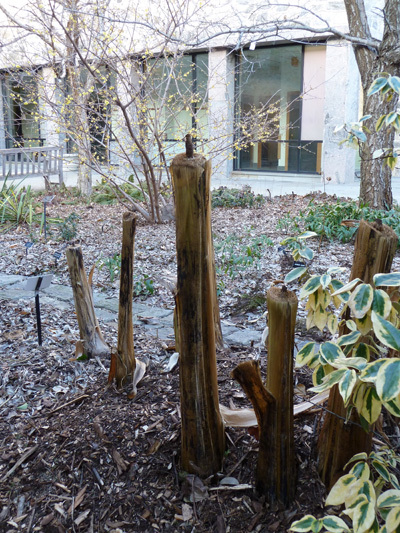 A large clump makes its home in the Cosby Courtyard. M. basjoo thrives in full sun and appreciates the sheltered location afforded to it by the walls of the surrounding buildings allowing its 6’ long, narrow leaves to remain un-tattered by strong winds. As the growing season wanes, the pseudostems are cut leaving roughly 1-2’ above ground. A generous blanket of equal proportions of leaf mold and aged woodchips is heaped around the plant. Gardener Nicole Selby has been mulching a little less each season. The experiment is allowing her to test the hardiness of the plant. While she is not ready to try a winter without the insulating mulch, she and other sources recommend a good mulching until the clump becomes well-established. 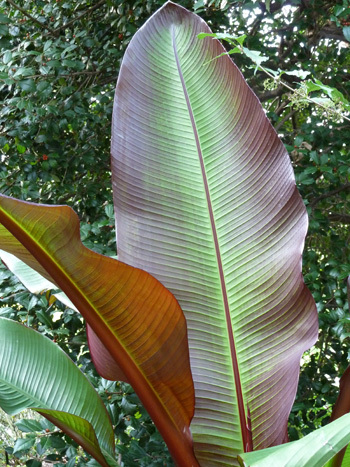 Musa ‘Siam Ruby’ is a diminutive banana with stunning ruby red leaves flecked with random green blocks. The plant reaches 8’ in height and is an ideal choice for those restricted by space. M. ‘Siam Ruby’ is not hardy in our zone and must be stored in a frost-free area for the winter. Thankfully the plant’s smaller size makes digging manageable. 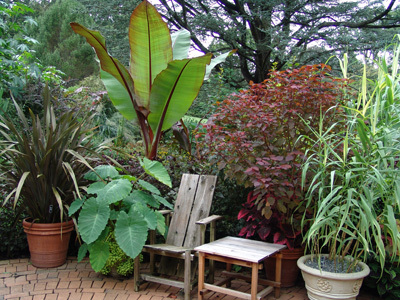 Additional cultivars and species of Musa have become available in recent years. 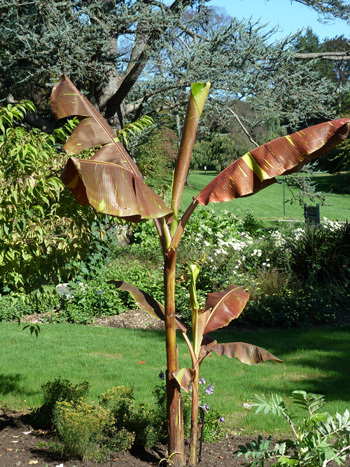 Ensete, known as the Abyssinian banana, is comprised of about seven species of banana-like plants from tropical Africa and Asia. Unlike the genus Musa, these plants are monocarpic and do not sucker. Only one species is common in cultivation. Ensete ventricosum ‘Maurelii’ grows to 10’ (up to 20’ in tropical areas) with leaves of equal length! Leaves are flushed with burgundy-red hues, a trait that is more pronounced in the new growth and with high light levels. Dig E. ventricosum ‘Maurelii’ after the first frost, cutting leaves back to the pseudostem, and store in a dark, cool location. Sadly, plants die after flowering. I have yet to see flowering occur in gardens where the plant must be dug and stored for the winter. The Tropical Look by Robert Lee Riffle lists “three flies in this ointment.” First, bananas, both Musa and Ensete are easily shredded by wind. Plant in a sheltered location or accept that shredded leaves come with the territority. Use a sharp knife to cut aged and tattered leaves back to the pseudostem. Second, Musa basjoo tends to migrate from its original planting location as the center dies and gives rise to new pseudostems. The solution is to simply plant where this minor movement isn’t a problem or replant young suckers. Lastly, the sap of all Musa stains fabric so wearing old gardening clothes is a must. I would add that Ensete poses one additional consideration. Over time, the pseudostem acquires a hefty girth. The size, coupled with the volume of retained water, make moving the plant a challenge. One idea is to grow the plant for several seasons until it becomes too large to manage or enlist help with moving the plant. While bananas require additional care and maintenance, the visual tropical impact they provide is hard to surpass. As you peruse the latest gardening catalogs and dream about the upcoming season, imagine a banana in that vision. Several Musa and Ensete selections will be available at the Unusual Tropicals and Annuals Sale on May 18 to 20, 2012. Does Musa basjoo get actual (edible) bananas? 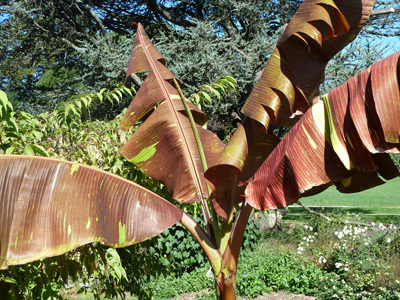 Musa basjoo is primarily grown for its tropical foliage. Sources state that fruits are small, green and inedible. Historically the plant has been grown in Japan as a fiber plant (fabric/textile). One common name associated with the species is Japanese fiber banana. 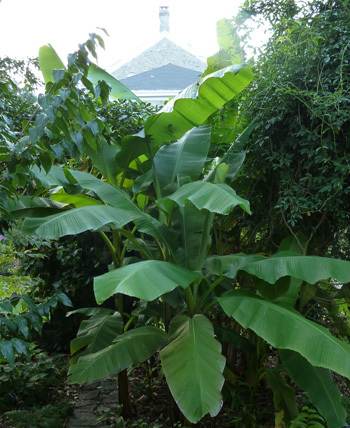 Hi there I have a Banana Tree ( Musa Ensete) I have had conflicting information to whether or not it will produce fruit. Would you be able to tell me please? First question, where do you live? 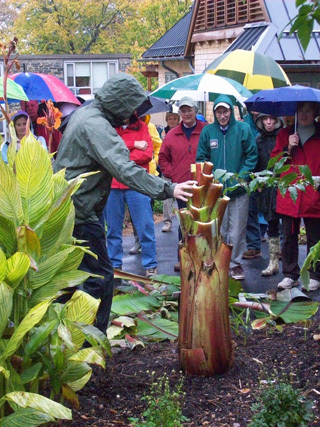 A Musa in Florida has a great possibility of blooming whereas here in Eastern Pennsylvania I’ve never seen a banana bloom. Some local gardeners have been able to get Musa basjoo to bloom but such occurrences are rare. Our growing season is too short for banana flowers. Nonetheless, I love the foliage they add to the warm-weather garden. Is the fruit of Ensete edible! Why does no one seem to want to answer this!? I have googled, and asked several websites, but the question is utterly ignored, even though the same question in regard to M. basjoo was abswered.